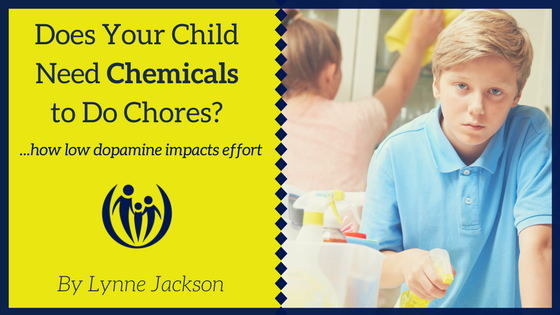 Does Your Child Need Chemicals to do Chores? In our role as parent coaches and educators, we hear it all the time: “One of my kids just doesn’t seem to get it!” Parents go on to describe the child in their home who frequently resists and escapes chores and assigned tasks in spite of all the clear instructions. They then tell us that, in contrast, the other kids in their family seem to be mostly compliant. Resentment builds as these kids become increasingly aware of the comparison between themselves and (what they perceive to be) their favored siblings. Discouragement settles in as distraction, resistance, and conflict grow. It also isn’t helpful to simply brush off expectations and go easier on kids with low dopamine. In fact, your inclination to set clear parameters and high expectations is likely just what they need. The key, however, is for them to see your compassion and understanding, and being intentional about building your kids’ dopamine levels in a positive manner. God designed us to work hard every day and feel good about it. But, it is normal and natural to seek what we consider pleasurable and avoid what we perceive as pain. In view of that truth, how in the world can we motivate kids to do hard work? Christopher Bergland is an endurance athlete, coach, and author. He states that the secret is to “view struggle and perseverance as a doorway to pleasure” by feeling good about accomplishing something every day. If we don’t accomplish something every day it drains our dopamine levels. Bergland offers hope for parents and kids, “Learning and conditioning yourself to self-administer this [dopamine] ‘reward molecule’ every day can turn anyone into a go-getter.” He’s essentially saying that a child must consciously acknowledge (celebrate!) the success of achieving a goal in order to release the dopamine that strengthens perseverance. If you skip that step of celebration there will be no brain change. Break tasks down into small chunks. Help your child break overwhelming chores into more manageable tasks that can each provide a mini-dopamine burst from a sense of accomplishment. Insert a brief, fun break in between those small chunks. Sometimes our daughter would practice half her piano lesson, then take a five minute play break on the swing we had hanging in our basement. That gave her the dopamine boost she needed to finish her task. Incorporate a dopamine booster while doing the task, such as music, a snack, or figuring out a new, creative way to do the task. One mom I know sets a timer while her daughter races to “break the record” unloading the dishwasher. Teach kids that their brain grows the most when things are difficult. One book we recommend for ages 4 to 8 is Your Fantastic Elastic Brain. Encourage your child to be part of the team as your family works together. Whenever possible, try to have a time when your family does chores alongside each other. It’s often easier to get a job done when you know everyone else is doing theirs too! Low levels of dopamine might explain why one child is consistently high achieving while another child struggles. But it isn’t an excuse to let your child off the hook and cause them to miss learning the pleasure of working hard. Working with your child to help raise their dopamine levels as they learn to value and celebrate hard work might be just what they need to make a breakthrough! We talk about this and so much more in our four session online course The Entitlement Fix: Growing Hard Work and Gratitude In Your Kids! ← Are We Dealing Drugs To Our Children?